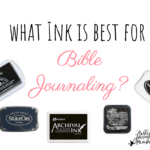 Finding the best stamping ink for Bible journaling can feel overwhelming. There are different types of ink for every project. The best stamping ink type for Bible journaling is one that does double duty, both as a watercolor and as a stamping medium. Not all stamping inks are the same. Once you understand the differences, you’ll be able to choose the ink that best works in your Bible journaling or other special project. If you’re unsure of the type of ink you like to use, buy one pad and try it out before you invest in multiple colors. When you do invest in multiple colors, consider getting the small 2″ x 2″ pads so you can get more colors for your budget. When it comes to ink, there are six different types that stampers use. Make sure that whatever ink you buy, that it’s non-toxic and acid-free. Most stamping inks are. The best stamping ink for Bible journaling depends on your preference, but here are my top three favorites and facts on the rest. Pigment ink – Pigment ink generally sits on top of the page and takes a few minutes to dry. You may see some bleedthrough or ghosting with it, but it can reduced if your page is prepped with gesso. Chalk ink – Use a light application so that sits on top of your Bible page and generally won’t bleed through. Dye-based ink – Distressed ink or waterproof ink can be used to stamp on your Bible or used as watercolor. Prep or your Bible page with gesso if you’re concerned about bleed through. I use an old ink pad and rarely have problems with bleed through. If your ink pad is “juicy” stamp off on a scrap piece of paper before applying the stamp to your Bible to reduce bleed through. Solvent ink – Used for stamping images and then coloring them with watercolor (but not alcohol pens). I almost always get bleed through with solvent ink. Embossing Ink – Be careful when using this for Bible journaling because you can burn your pages with the heat gun if you’re not careful. It is generally used for embossing using embossing powders. Pigment inks are water-based, yet have a much thicker consistency than dye inks, so they don’t dry as fast. The misty color particles are suspended inside the ink, as opposed to broken down into it like a dye ink. This moderate drying nature makes them ideal for embossing, as you have a longer “open” time to apply your embossing powders. Pigment stamping inks don’t seep into the paper like dye inks. They sit on the surface and are perfect for stamping on or applying directly to ordinary paper, tissue, wood, and other porous surfaces. The thicker consistency of pigment inks implies that the color you see on the ink pad is like the color that it will display when stamped. Color ink pads are made of spongy material, rather than the hard raised felt pad found with dye inks. Pigment inks are generally pretty slow drying, giving you plenty of time to emboss and blend. These inks offer long lasting, luscious color from delicate pastels to deep, saturated hues. Pigment ink is difficult to use in Bible journaling because it takes long to dry. You can attempt to dry it with a heat setting tool, but be careful as heat can damage Bible pages. Pigment ink brands include: ColorBox Pigment Ink, Illustrated Faith, Brilliance Archival Ink Pads by Tsukineko, and Stampin up Craft Ink. You can buy pigment ink stamps here . Dye-based ink is fast drying and magnificent for basic stamping. It’s the most common stamping ink on the market and comes in many colors. It’s perfect for those new to stamping. Dye-based ink is water-based and often manufactured on linen, felt, foam, and sponge type surfaces. When you use dye-based ink, it can seep into the strands of the paper as opposed to sitting on top like a pigment ink. If you don’t want it to seep into the paper, you’ll need to get watercolor paper. Watercolor paper has a smooth surface, resists buckling and dries fast. Some dye-based stamping inks tend to fade over time. To avoid this, search for ink pads with fade-resistant or archival on the label. There are three different types of dye-based ink: water-proof, water-resistant, and distressed ink. After years of stamping, I believe that water-proof and water-resistant are used interchangeably with the manufacturers. However, I will attempt to break them down based on the manufacturer’s product descriptions. Some dye-based stamping inks are waterproof when dry, but some aren’t. Waterproof means that it’s impervious to water, so once it’s dry, it’s dry. They often dry quickly. If you need to watercolor over your stamped pictures, you’ll have to utilize a stamping ink that’s marked as waterproof. You can use water-resistant as well, just make sure it’s dry. Water-resistant means that the ink resists the penetration of water to some degree. It’s not water-proof, rather it’s one degree removed. Water-resistant stamping ink won’t bleed when using paint, watercolors, colored pencils, water-based inks, markers or pearl pigments. It will also dry on glossy paper and is a great ink for stamping detailed images. These ink pads are often fade-resistant. Water-resistant inks can serve dual purposes functioning both as a stamping ink and as a watercolor. Simply dab some ink onto a tile, or similar surface, and apply the color with a paintbrush. Water-resistant ink brands include: Ranger Archival Ink, ColorBox Archival Dye Ink Pads, Stampin up Archival Stampin Pad, and Tsukineko Momento Dye Ink. You can buy dye ink stamps here . Distress inks are water-based, not-toxic, acid-free, fade-resistant dye inks. The stamping inks are wet and stay “open” longer than standard dye-inks allowing you to continue to blend and work with the ink. Many crafters use distressed ink to get vintage effects. From rubbing, edging, and mixing the ink, the possibilities are endless. Plus the colors are cool. Distressed inks are a favorite amongst Bible journaling enthusiasts. The applications and ability to get the stained, vintage and aged effects in your Bible are unmatched by the other brands. The line currently includes 61 different colors, including brightly colored peacock , raspberry, and berries. Distressed ink brands include: Ranger Tim Holtz Line. 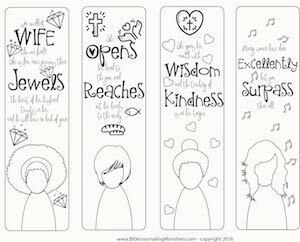 You can buy distress ink stamps here . Chalk ink pads are perfect for all styles of paper crafting. These stamping inks are permanent, and they dry fast. They work great on wood, leather, coated and uncoated papers. Chalk Ink sits on top of the page and generally won’t bleed through. Many Bible journaling fans love solvent-based inks because they often don’t bleed through and provide minimal ghosting. I don’t recommend them only because they’re so hard to clean off your stamps. Solvent-based stamping inks are fast drying inks. They are not water-based inks. There are three elements in solvent ink: the carrier fluid, pigment and resin. Solvent based inks require a special cleaner to get the ink off the stamps. The problem with the cleaner is that it can harm polymer stamps, so use it sparingly. Solvent-based stamping inks also have a unique “scent” to them. Solvent-based inks work best on all non-porous and semi-porous surfaces, like glass, metal, transparencies, vellum, glass, glazed ceramic tile, metal, acrylic plastic. They dry in under five minutes and pretty much lasts forever. You can use watercolors and watercolor pencils with solvent ink after it’s dry. Never use alcohol pens with solvent-based inks as they can damage your pens. Solvent ink brands include: Stazon. You can buy stazon stamps here . Embossing inks are clear pigment stamping inks allows you to experiment with a variety of techniques such as chalking, embossing, and resisting. Ink pads come in many different styles, including rectangle, square, small square, cats eye, and dew drop. The cats eye and dew drop style is perfect for getting in small tight spaces because they have a sharp point on at least one end. They are also great for inking the sides and edges of the paper. Larger pads work great for getting a great even application on larger stamps. Like mediums blend and mix together. You can use dye-based stamping ink with alcohol-based markers, but you wouldn’t want to use dye-based ink with watercolors and regular markers as they would blend together. Never use alcohol ink pens with your solvent ink as your solvent ink will damage your very expensive pens. We hope this guide to stamping ink in Bible journaling has helped illuminate the different choices you have. What inks do you use in your Bible journaling? What do you clean the stamps with after using. I bought a waterproof ink. Thanks for your help. If you use water right away, it will wipe off with a towel or wipe. If you don’t do it right away you need a stamp cleaner like the one made by ranger here: http://amzn.to/2tD9XM7.